From TaylorMade: "The traditional look comes from the thin topline, mirror chrome finish, straight leading edge and minimal offset. The modern conveniences of optimal weighting and center of gravity are achieved through TaylorMade's exclusive trapezoidal cavity pad, which is placed behind the impact zone to maintain ball velocity and preserve feel. Like the 320 and 360 irons, the long irons in the Forged 300 set have negative bounce to help create lift, while the short irons have positive bounce to prevent ballooned shots." THESE IRONS ARE UNBELIEVABLE, I PLAY GOLF COURSE'S TOTALLY DIFFERENT YARDAGE IS GREAT, MY 8 IRON AVERAGE IS 155, BEFORE I WAS LUCKY TO GET 140yds. MY T300's have stiff shafts, I DONT GET NERVOUS WHEN PLAYING A TIGHT COURSE. I JUSTR NEED TO FIND A GRIP THAT IS COMFORTABLE. AND THE REASON IM WRITING THIS REVIEW IS . I AM 55 YRS. OLD, I HAVE HAD 3 HIP REPLACEMENTS, L BIG TOE NEEDS TO BE FUSED,BULDGED DISC IN NECK. BOTH KNEES SCOPED TO MANY TIMES TO REMEMBER, I WAS TOLD THAT THIS SET OF IRONS WAS FOR THE SCRATCH GOLFER ESPECIALLY WITH STIFF SHAFT'S. BUT I HAVENT BEEN DISAPOINTED WITH THE WAY IM HITTING THE BALL, AND IF TAYLOR MADE WANT'S ME TO GO TO WORK FOR THEM I WOULD STRONGLY CONSIDER IT, GREAT PRODUCT. Best irons TaylorMade ever produced. Pingi3's, Titleist 990's and DCI's, Maxfli Revolutions, Mizuno MP 37's and 60's, Pingi15, TaylorMade Tour Preferreds, etc. These irons are awesome! There is not one bad thing I can say about these sticks. First of all the clubs are just plain beatiful at address and in the bag, which matters to me. They hit long and they are more forgiving on off-center strikes than you would think and give great feedback. I am not really a shot shaper but I'm sure these can maneuver just fine for a surgeon. I have the 7 8 9 and PW only. My 4 5 and 6 iron are taylormade RAC OS2. I hit my 300 7 iron the same distance as my RAC 6 iron (165-170 yards) and the ball flight is pretty high too. The feel of a well struck ball is just awesome and sooooooo satisfying and fun to watch. They will forgive you on off-center hits but they will still let you know you missed. I've hit a few way out on the toe, I mean way out- halfway off the grooves. even then, you still get about 85-90% of it. These clubs also seem to be pretty durable for forged irons. I have played about 50-60 rounds with mine and they still look almost new. Bag clatter is minimal. I am a little bit of an ebay club junkie but these babies are gonna stay in the bag for a while. I am now looking to get a full set and get rid of my oversize long irons because my iron play is improving fast. You can get a set of these on ebay in great condition for less than $200. Do it!!! You won't be sorry. These perform just as well as any forged cavity backs that have hit the market... Titleist, Mizuno, Callaway, Hogan, all of them. I would love to see some fresh reviews on these and how some others would compare them to other forged sets on the market... lets hear it. I played the game for 7 years now and had been using the TM 200 irons since. I like the feel of these irons. Hit my 6 iron a decent 175 yards and 4 iron 190 yards. Still does not handle the no.3 well but I think I'll get there in a couple years or so. I am current looking for a used 6 iron and AW to replace wear and tear they are my favorite clubs. taylormade first gave me these irons in 2004 and i have been using them ever since, these irons are forgiving to the accurate player. i love my irons, i got raw distance with them i hit my 3 iron 260metres on an average swing! i use taylormade wedges that are also great! Forgiveness - Ideally suited for a player who is reasonably consistent in hitting the sweet spot. Clubs have a shallow cavity. Forgiveness is between a cavity and blade iron. Workability - Very workable. Want to hit a fade, draw, knock-down or any combination - No problem. Looks - Looks like a blade from the top with a thin top line, but with a slightly longer blade length than the typical blade. Nice chrome finish that looks classic and easy to keep clean. Distance - Distance is largely a function of loft, shaft flex and hitting the sweet spot. These irons have lofts that are slightly weaker than today's typical irons. As a result, they play slightly shorter. This is a positive, not a negative. The marketers are out of control -- they continue to reduce iron lofts to satisfy golfer egos. I prefer a PW with 48 degrees of loft so I can transition nicely to a 52 degree gap wedge. Don't select irons because they are longer. Lies - Long iron lies are flatter than today's typical standard. Short irons are similar to today's standard. I adjusted the lofts in the long irons to be slightly more upright. Lofts should be adjusted based on dynamic swing testing. Shafts - Using the Rifle Flighted 5.5's. Long irons fly slightly higher than the "old standard" True Temper Dynamcic shafts. Distance recommendations can be found on Rifle's website. Compared to the True Temper Dynamic shaft, the 5.5 flex plays slightly softer while the 6.0 flex plays slight stiffer. Again great irons! Perfect for someone seeking a semi-players iron that is somewhat forgiving. Too many to list, but mostly name brand clubs in the player or mid-game improvement category. I bought my 300s in 2004, loved them, then(as you do), decided it was time to move on to another set, new clubs, better golf, I thought. but for some strange reason I keep coming back to these irons. With everything I've tried, including Taylormade's latest irons, I cannot find an iron that feels as solid and great to look at as the 300 forged. I have bought and sold many sets, but I will not sell my 300s, a great set of irons that surpass anything produced since. Titleist 690mb, Taylor made TP RACmb. 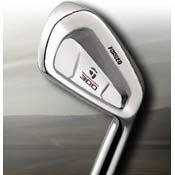 i never played golf in my life and my uncle bob told me to try these TM300s as they are a good starter set. I hit the ball far. for example, my 5 iron flys 210. I like to say booomshalaka after i hit the ball. feeeeels goood.